When I talked with Sarah earlier this week about immersing ourselves in Advent and Christmas reading during these December weeks, I stressed that the books and activities of the season aren't things I heap on to an already full academic plan. Instead, I apply the principles of a Storybook Year and seize the interest and enthusiasm of my children for the thrilling events of this time of year and just make that what we're learning and doing. This is also the big decorating week around our house. Christmas greens are the best botany lesson of all in December! The week ahead looks downright balmy--perfect for an outdoor adventure. So in our house, this is a good week totravel along a Christmas trail and inhale the sweet smells of evergreen along the way. it's also a very good week to take advantage of the total family immersion in the Nutcracker to look at some art and music and storytelling. Remember, the whole idea behind a Storybook year, particularly during seasons of lots of outside-the-box learning (like dance productions), is to seize the enthusiasm and also the "real world" context for what kids are learning, not to kill yourself doing more and more and more. So, as the tree goes up and the boughs get trimmed and the halls get decked, we can look a little more closely at the greenery. We can learn about coniferous trees and study the botanical information we can glean from looking carefully at Christmas trees: Scots pine (Pinus sylvestris), Douglas fir (Pseudotsuga menziesii), Noble fir (Abies procera), and Norway spruce (Picea abies). Though we have a big brother away at college who really can't breathe in the presence of a pine tree, my bunch at home and I will visit a Christmas tree farm to gather some boughs and cones in order to carefully draw and compare needles and cones. We won't leave them here in the house when Patrick arrives home, though. There's a lot to be learned in picture books and a whole lot of science waiting to gently happen as you look carefully at Christmas greens. We've had great success teaching basic botany with books like Pine Trees and Golden Field Guides. This week, we're focusing on conifers. Want to come along? Simply read the books with your child and then work your way through together, discussing the concepts, narrating, and drawing. Don't be tempted to leave out the "drawing" step--it really does enhance understanding and retention. For further study, botanical nomenclature cards are a good way to apply the Montessori three period lesson to botany study. These cards can also be used for drawing and labeling. We also thoroughly enjoyed giggling over Talulah's Nutcracker and Angelina's Nutcracker. One of the benefits that comes with having taken the time to archive lessons in years past is that I don't have to start from scratch when I want to begin with a child's interest and take it somewhere constructive. Below is a post from 2007 together with an update. Next week begins Monday Night Football, noted on my calendar for the entire season as "MNF." Why does a middle-aged mama note Monday Night Football on her calendar? I like to keep track of my husband. He won't be on the couch with a beer and a bowl of chips. He'll be at every Monday Night Football site all season long (with the exception of the double-booked nights--he can't bi-locate so when MNF is at two locations, he's only at one of them;-). As much as we love sports around here and as grateful as we are for this job, this is a very long haul through the fall. Last year, as my younger children began to figure out the rhythm to Mike's travels, we started moving a Post-it note arrow around on a big wall map so that they could see where he was. But a flat map on the wall doesn't really do much for a child's imagination. They couldn't really picture him where he was working. 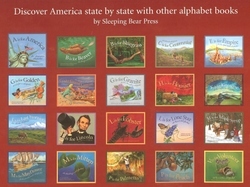 Kim introduced me to the idea of geography textboxes and I found these wonderful picture books, and an idea was born. Every week, on Monday, we spend the afternoon reading and writing about the state where Monday Night Football is being played. The books are packed with information and illustrations and pictures. There is a short rhyming verse on each page, perfect for the little ones. The older children spend more time with the book, reading the more involved columns on the page for detail. The year the baby arrived four weeks into football season. I relied heavily on the idea in these free unit studies which are keyed to the books. This year, I think we are going to focus only on the information in the book during our study time. Each child is creating his or her own book. The books vary according to age and interest and I'm giving the children free reign to pull out of the alphabet books what matters most to them and then to express that in their notebooks. On Monday evenings, we watch ESPN beginning well before the game. In all honesty, this has nothing to do with geography and everything to do with our Daddy's shows. But, the bonus to our devotion is that we see great scenic shots of the places we've just read in the books. All the way up through the pre-game show and the introduction, there are sights and sounds of the state we've studied. Finally, as he dashes through the airport on his way home, Mike collects a few postcards from each state to add to the book. All the books we will use for Monday Night Football geography (and plenty more) are linked on the sidebar. Maybe you'd like to travel with us this fall! Mike is no longer traveling with Monday Night Football. The child whose narration is pictured above is now a a couple months away from graduating college. What follows is from two years ago. I thought the tradition would do a slow fade this year. It hasn't. Nick isn't letting this one go--maybe ever. So, tonight, we are having bratwursts with cheese. Stephen really lobbied for Kansas BBQ, but Nick, faithful keeper of the tradition, won out. I am ever so grateful that I recorded this study when I did, because I was reminded this morning. Longtime readers will recognize Paddy as the boy who always had a ball at his feet. In the absence of a ball, he had wadded up newspaper, socks, pillows, whatever he could get those feet on. Paddy is playing soccer at UVa now, but the incessant sound of dribbling is still making me nuts on Monday mornings. "Nicholas, keep your feet still." Nicholas, please try to finish up that lesson." "Good golly, child, will you PLEASE stop with the dang ball!" Mary Beth looked at me and said "Does this feel like Paddy all over again?" The big difference is that Paddy was never a huge football fan. He was a huge Daddy fan, but football wasn't a passion. The Monday Night Football hook for him was tracking Dad. Nicholas, on the other hand, is obsessed with all things ESPN, especially football. "Hey Nick, who plays tonight?" "How about if we study them today? You read these two books and then make two main lesson pages (see Paddy's examples) and we can make football food from Cincinnati and Pittsburgh." "Wait, you mean we can have Philly Cheesesteaks?!?!" "NOoooo, research Pittsburgh and Cincinnati food and get back to me." And so, tonight, we will have cabbage rolls and pierogies for dinner. Then we'll have Buckeyes for dessert. He's already planning menus for the rest of the season. And later today, he's going to treat himself to T is for Touchdown.